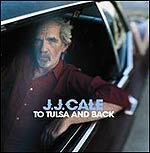 CD review: "To Tulsa and Back"
It isn't fair, but the fact remains that it is near-impossible to listen to J.J. Cale sing without also hearing Eric Clapton's voice. Truth is, Clapton pretty much lifted his entire singing style whole from Cale's early 1970s recordings (you ever get the chance, listen to early Clapton with John Mayall's Bluesbreakers in the 1960s for a before and after comparison). Add in the fact that some of Clapton's biggest hits were covers of songs written by Cale  "Cocaine," "After Midnight"  and it's a connection not easily broken. And so even when listening to a brand-new album by Cale, with songs you've never heard before, you still hear Clapton as much as you hear Cale himself. Well, and Mark Knopfler of Dire Straits  for Knopfler's guitar and singing were also heavily shaped by Cale's style. Of course, both Clapton and Knopfler took Cale's slowly measured way of singing, that almost-spoken approach that gives his music its intimate, conversational appeal, and became huge international stars. Made millions off of it. Cale? He never seemed to care much for the spotlight, just wanted to turn out an album of new songs every so often. Perhaps the best we can do is admit the unfairness of it all, and then listen to the latest CD from Cale, "To Tulsa and Back," a couple more times  because it is as good a collection of songs as Cale has yet produced, and that's saying something. From the plaintive "Blues for Mama" to the slow shuffle of "My Gal," the rocking "Motormouth" to the swinging folk of "Stone River," each song here is distinctively, immediately identifiable as being from Cale's pen. Just as Cole Porter had a consistent musical voice, just as you can hear any song by Johnny Cash and know it's his within a couple of notes, so do the baker's dozen new tunes here have that immeasurable but palpable Cale stamp on them. His voice hasn't changed much through the years  it was always rough at the edges, and if he's lost anything vocally, it isn't apparent. On guitar, Cale's approach remains to aim more for tasteful style than showmanship; the man's ability to play the right note has only deepened with time. But with Cale, it's the songs that keep bringing you back more than the performance. And as good a batch as he's turned out this time, this album has to rank as one of his very best.